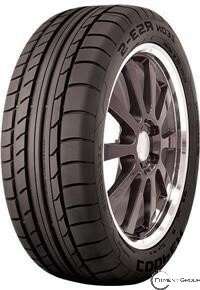 The asymmetric design allows for tread pattern tuning. This design allows for cross-rotation which reduces heal-toe wear, promotes even wear, less noise and increased overall tread life. The outboard tread pattern is tuned for excellent dry handling and traction. The inboard of the pattern is optimized for wet weather conditions. Dual pitch sequence provides a low tread pattern noise. Increased grooves create more void on the inside of the tread pattern which helps maintain better wet performance. Wide, circumferential grooves are positioned towards the inside of the tread pattern. This increases the size of the outside shoulder and the intermediate tread element rows which allows for more rubber on the outside of the pattern for ultimate dry traction, increased handling and exceptional cornering ability. The increased void and two circumferential grooves on the inside of the pattern channel water out of the tread for hydroplane resistance. The variable draft groove walls help provide even treadwear. Large intermediate tread elements are joined together for stable cornering and reduced noise. Laterally oriented shoulder grooves and uniform element geometry minimizes irregular wear. Variable draft groove walls also reduces uneven treadwear. Silica formulated tread compound is designed for exceptional wet driving performance. Crisp and tight steering response is delivered by a combination of high density belt wire, high modulus polyester plies and high modulus bead filler. Lighter weight construction reduces the tire's rolling mass for improved fuel efficiency.